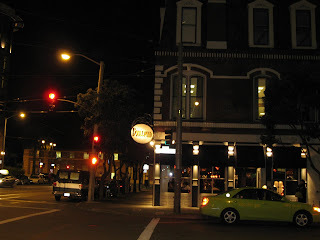 The SoMa area of San Francisco where my hotel is located has many good restaurants. I counted four Michelin starred-restaurants within walking distance of my hotel. I have already eaten at Ame during previous visits here and written about it. This time I decided to walk down to Boulevard, one of San Francisco's best, which is located close to the waterfront near the Ferry Building. The restaurant is located in a quaint old building which has a lot of history. The 1889 French-style Audiffred Building is one of the few structures spared from the 1906 earthquake and fire. It is located just across the road from Ferry Plaza. Legend has it that the former Bulkhead Coffee Parlor's saloonkeeper held off firemen ready to dynamite the Audiffred to halt the spread of fire during the 1906 earthquake. In order to save the building, he promised them two quarts of whiskey apiece and a firehouse cart full of wine! The beauty of Boulevard's three-story historic home, built in the style of Parisian commercial buildings of its day was magnified by the completion in October 1996 of the San Francisco waterfront revival project. You enter into the restaurant through an antique wooden turn-style door atop which is perched a peacock - or rather a life-like sculpture of one. The restaurant itself is a white table-top affair but homey, warm and inviting. A patterned brickwork ceiling, hand-blown lighting fixtures from another era, a bar area embellished with painted glass and a peacock mosaic design on the floor. The restaurant was busy and since I was alone the host suggested I use the bar area, but then they were able to find me a table in a cozy corner. As I nursed a glass of Sauvignon Blanc, I perused the menu. The wait staff was very courteous and the service was very good through-out. 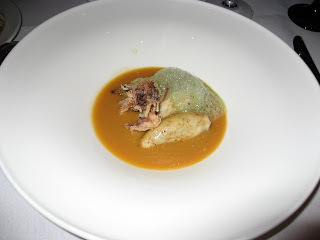 I began with a starter of local Calamari stuffed with crab in crab bisque & leek mousseline. For my entree I chose the Washington Steelhead Salmon - wild caught and wood fire grilled on green & white asparagus, truffle relish, Yukon Gold potatoes, golden egg aioli with lemon & mustard. While the stuffed calamari was interesting, the salmon was exceptional. Freshly cooked to perfection, the steak was moist, flavorful and with great texture, it was one of the best salmon preparations I have ever eaten. The asparagus and truffle relish complimented the taste of salmon very well. I took my time relishing every morsel before I moved on to the dessert. 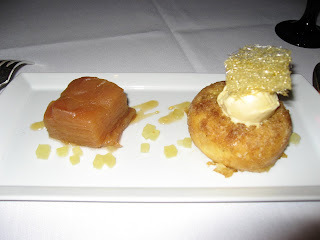 For dessert I ordered the Rome Beauty Apple Terrine which came with warm vanilla soaked Savarin, brown sugar ice-cream, cider soaked apples, and apple caramel. Again an excellent choice. I know I am coming back here again to try the other items on their menu! Boulevard's owner and chef Nancy Oakes is very popular with foodies here. Locals have often voted her as their most popular chef in San Francisco. In 2001 she garnered a tremendous and much-deserved James Beard Foundation Award for Best Chef in California. She and her crew continue to cook a la minute for each diner, having created a menu such that in any evening, they are preparing a relatively small number of each item. "When you order a chicken, we actually cook it to order for you over the open fire in our wood-burning oven. There are no shortcuts. Even our pastries and cookies are made in small batches so they have a home-baked quality. We all feel a reverence for the food we use... we choose diver scallops rather than dredged, and fruits and vegetables straight from the farm or the farmer's market. In our kitchen, we all share San Francisco's love and commitment to good food," says Oakes. I can testify that her food is very good indeed! The dishes look awesome and best of all... no snow in the streets! Wait for me, I'm on my wayyyyyyyyyyy! @sig: You should. I expect to come back here again too! @zhu: Haha! No snow, but plenty chilly, cold, and wet. firstly i envy you for having your own restaurant. I'd love to have my own some day ... or maybe just a desserts cafe or somethin. I 'm sure its a tough job. Great food. I would love to visit San Francisco some day, i hope i will. @xtourist: SFO has an endless choice of places for foodies.